This spring, Busch Gardens Tampa Bay will welcome families to an all-new, Sesame Street-themed play land. Sesame Street Safari of Fun will be filled with kid-size rides, water fun, shows and adventures that celebrate the spirit of Africa. 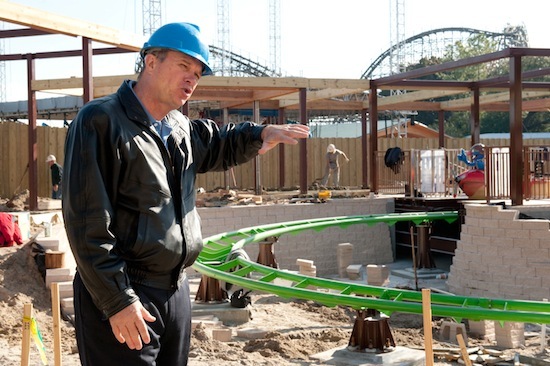 One highlight of the area is a new junior roller coaster designed for parents and children to ride together. “Air Grover” is full of mini-dives and twisty turns as families soar through the Sahara. “Oscar’s Swamp Stomp” provides cool water fun, and “Bert & Ernie’s Water Hole” is a wet adventure filled with bubblers, geysers, jets, dumping buckets and more. “Big Bird’s 123-Smile with Me” photography studio gives kids the chance to share a hug and a smile with Sesame Street friends, and musical performances bring safari tales to life. The new destination for family-friendly adventure is being created where Land of the Dragons exists, and will double the area’s current size to 2.5 acres. In addition to the rides and play areas, families will also be able to watch their favorite characters on the big screen. 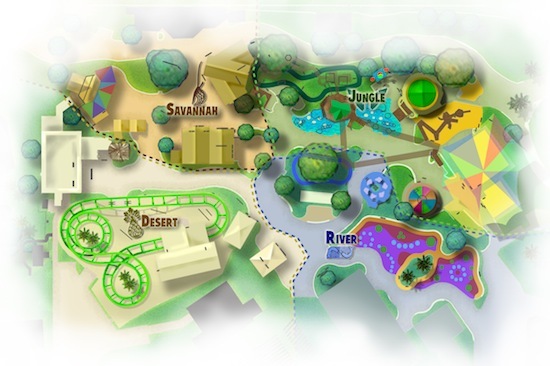 “Sesame Street presents Lights, Camera, Imagination!” will run in the park’s 4-D theater, located in Timbuktu. The fun-filled, 4-D movie brings Sesame Street Muppets’ adventures to life with zany 3-D gags and special effects like wind, water and jump-out-of-your-seat surprises. Families will be able to share breakfast and lunch with Elmo and his friends on select days at an outdoor dining facility adjacent to Sesame Street Safari of Fun. Air Grover: A junior coaster full of turns, mini-dives for parents and kids to ride together. The Count’s Zambezi Rally: A kid-size car ride that takes you on a jaunt through desert and tribal trails. 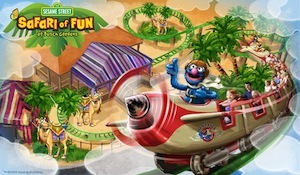 Snuffy’s Elephant Romp: Fly around and around and up and down on Snuffy’s fun friends. Elmo’s Treehouse Trek: A three-story hideaway to play hide-n-seek and get a bird’s eye view of the entire play land. Slimey’s Sahara Sand: A fun-filled, sand-filled beachy oasis where kids can frolic in the coolest desert around. Bert & Ernie’s Watering Hole: A water adventure filled with bubblers, geysers, jets, dumping buckets and more. Sunny Day Theater: Musical performances bring tales of adventure to life. Sesame Street presents “Lights, Camera, Imagination!”: A 4-D movie that brings the Sesame Street Muppets’ adventures to life with zany 3-D gags and special effects like wind, water and jump-out-of-your-seat surprises. Plays in 4-D theater in Timbuktu area of the park. Dine with Elmo and Friends: Share breakfast or lunch with Elmo and his friends on select days at an outdoor dining facility adjacent to Sesame Street Safari of Fun. Snack-n-Getti Tribal Treats: Tasty treats to keep your energy up. Abby Cadabby’s Treasure Hut: A bazaar of unique items, including tons of safari treasures and Sesame Street gifts you can’t find any place else. Big Bird’s 123-Smile with Me: Meet and greet the Sesame Street characters. 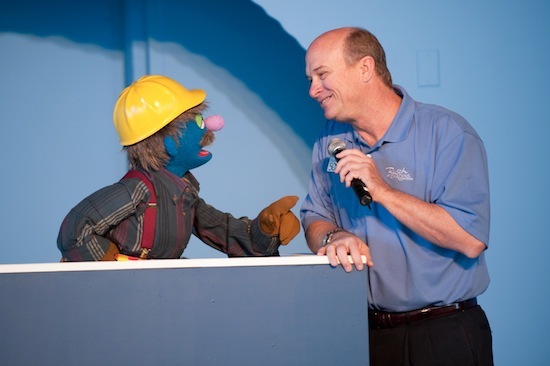 Vice President of Design & Engineering Mark Rose chats with Bif, the construction-worker Muppet, sharing details of the construction of Busch Gardens’ new Sesame Street Safari of Fun area during a media hard-hat tour on Thursday. After the presentation, Rose led the media on a tour of the construction site (top photo).